Real Tax Reform: An Efficient, Equitable, and Simple Plan in the U.S. This paper presents real tax reform that is not only efficient, equitable, and simple but revenue neutral. It also removes a significant amount of double taxation from the individual taxpayer. The underlying premise is that businesses do not actually “pay” income taxes but pass them on to the consumer. 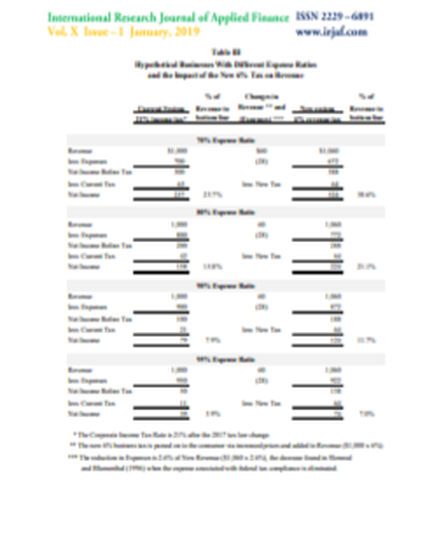 Our plan consists of eliminating all federal income taxation of individuals and changing business taxation from a tax computed on taxable income to a tax based on total audited revenue. After computing the combined amount of federal tax currently collected from individuals and all forms of businesses, we develop a revenue-based tax rate on businesses that provides the U.S. government with approximately the same amount of revenue as the current income tax system. In addition, this new revenue-based business tax reduces federal tax compliance costs for all taxpayers and the size of government. This document was originally published in International Research Journal of Applied Finance by the International Research Journal of Applied Finance. Copyright restrictions may apply.